Size: 7" x 11" (base) Height: 10"
In 2008 my sister, Mary Hester-Gragg, opened a new location of Soteria, her Health Food Store, in White House, Tennessee. To promote basketry classes at Soteria and the philosophy of reuse and recycling, this shopping basket was designed to fit behind the driver's seat or in the trunk of your car. It's a great piece that you'll enjoy using time and again. Calculate Supplies for 1 to 20 Soteria Green Baskets with the Basket Supply Calculator. The Supply List gives you the least expensive way to purchase the supplies for your quantity of baskets. View on-line or print to your printer. * These items have been rounded to 1 pound/coil because it is less expensive to purchase 1 pound than to purchase the foot quantity. 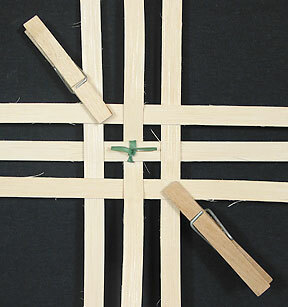 As you weave, gently push or pull on the stakes to keep them vertical and to maintain a pleasing shape. Square the corners a bit on each row of weaving; also, square the corners of your rims. Cut 7 pieces (stakes) 36" long and 11 stakes 34" long from 3/4" Flat Reed. Soak all the stakes. Mark two stakes--one that's 36" long and one that's 34" long, in the center on the rough side of the reed with a pencil. Place a twist-tie around the 36" marked stake and lay it on top of the 34" marked stake at a 90 degree angle, aligning the marks. See Photo. NOTE: The twist-tie identifies the center of the base. All stakes will be woven rough side up and placed about 1/4" apart; as you add each stake to your base, align its ends with the ends of these center stakes. Weave all 36" stakes parallel to the center 36" stake; weave all 34" stakes parallel to the center 34" stake. Next, weave a stake above the center horizontal stake and one below, placing each of these stakes under the center stake. Align stake ends. Next, weave 1 stake to the right and one to the left of center; weaving over the center stake and under the other 2 stakes. Space all stakes just about 1/4" apart and align the ends. Secure with clothespins as needed. See Photo. Continue adding stakes, working outward from the center, until you have interwoven all 18 stakes. 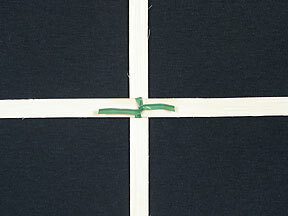 The woven area (base) should measure 7" x 11" with stakes extending about 12" from the edge of the base on each side. 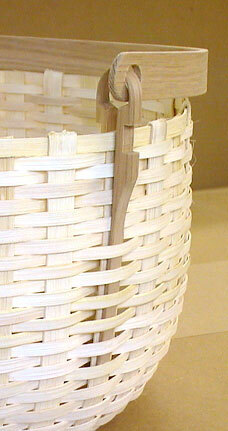 Soak the base and upset the basket by creasing each stake at the edge of the base. Pack rows. 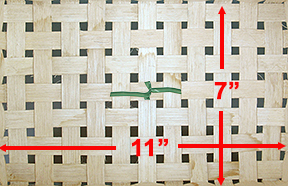 Crease, trim to length, then tuck each stake where the top row of weaver is on the inside of the basket. 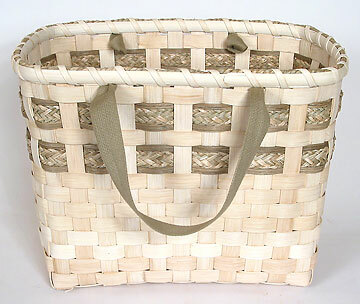 Hide each tucked end behind the rows of smoked and braided seagrass on the inside of your basket. Insert the ends of the shaker tape handles (1 yard each) underneath the top row. 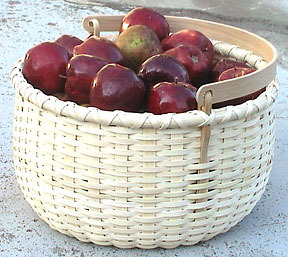 See basket photo at the top of the page for placement. Soak the 1/2" Flat Oval. Determine the rim lengths, allowing about a 4" overlap. Mark and carve each overlap. 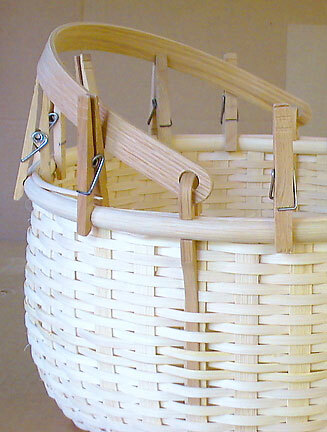 Using 1/4" Flat Reed, single lash the rims to the basket (creating a backstitch at the handles if desired). Pull Shaker Tape to desired length and trim. Tie a knot in the Shaker Tape on the inside of your basket and use needle & thread to secure the knot.